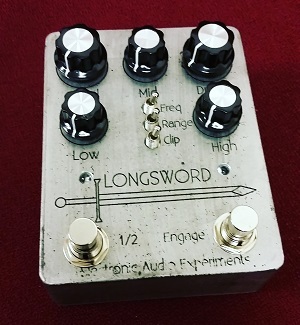 Boston based Electronic Audio Experiments has forged the Longsword. An op-amp based distortion pedal that takes the topology in a novel direction. Cascaded gain stages allow for tones ranging from clean boost to dynamic distortion to massively clipped fuzz, all with serious output volume available for driving the front end of an amp. The equalizer combines bass and treble shelving filters with an active, semi-parametric midrange boost/cut control. This lets the user sculpt a diverse array of tones and carve out a niche in even the most dense of mixes. The Longsword has a broad frequency response which makes it work equally well with guitar, baritone guitar, and bass.